ljcfyi: Yo! It's Yonanas! It's bananas! Yo! It's Yonanas! It's bananas! Remember when I blogged about one ingredient ice cream made from frozen bananas? My friend Peggy emailed me a link to a kitchen tool that makes it! Yonanas! I am a big fan of Alton Brown but there is one thing we disagree on - unitaskers. I get a kick out of them and I am intrigued by this one. They make it look so simple! A little odd looking, but easy! This has got to have some oomph, because even my food processer starts to overheat a bit pureeing those frozen bananas. Oooooh it's tempting! If this becomes available at BBB, I'm sooo getting one too. Cute find. I always joke about unitaskers/Alton Brown, heh! Although this would lower the good-for-you quotient, if you stirred in a couple of tablespoons of Nutella it would make this wunderbar! Thanks for checking out yonanas! I'm the inventor. We've made some tweaks to the the technology (it still has that unique shape and look:)) Glad you recognize it is easy to use, easy to clean. 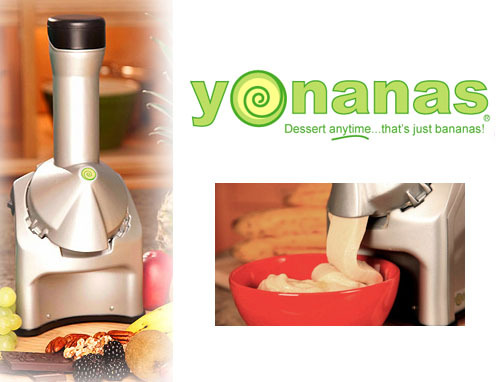 yonanas will be available in May...and yes, it will be at BBB in June. Are you located in the US....do not care for the made in China, but if the Invention is US then perfect! I've never blogged before. What is BBB? I found this blog because I am trying to decide whether to buy the yonana machine, and I don't want to have to pay shipping and handling if I decide to buy it. I've never blogged either. I'm deciding myself whether to get one. I can't eat ice cream but I make a lot of smoothies.I'm hoping this could replace ice cream for me. Wonder what sort of recipes are in the book. I just received this machine yesterday and I think its fantastic. I gave samples of it to my family members without telling them what it was and No one knew it was just Bananas. My nephew still doesn't know it's not banana Ice cream. I tried it in my Ninja and the consistancy just isn't the same as when it comes out of this machine. Once it gets to Bed Bath and Beyond I'll be getting a few more to give as gifts. I guess that means you'd recommend the machine. Have you added any other ingredients with the bananas? I'm curious how it is with chocolate or strawberries. Yonanas is very loud and turns bananas into thick mush, what a waste of money. They charge $19.95 S&H and they will not allow a return. "RIP-OFF"
HSN has this machine and their shipping and handling is just $7.95. DON’T BUY THIS THING!!! Wish I had done a search on reviews before I bought it myself. I bought the YONANAS machine after seeing it on the Hungry Girl website. It is a huge disappointment; the resulting banana concoction is runny and terrible, no matter how I alter the frozen fruits. Their site had no return info so I called the company, “Healthy Foods”. The operator simply took messages; that’s the extent of reaching the company. I was informed that there IS no return policy, which is why none is stated on their site. (I should’ve realized then that the company was questionable.) After pressing the issue, the operator then said that I could exchange it for another one. With the postage costing $29 each way for the original one, I told her I was not going to pursue it. HUGE disappointment. Can’t believe I was that stupid… And now, their website is "down". The Yonanas motor burned out after one minute of use. Called the company and like others was told they have no returns. If you are going to get one make sure you buy it somewhere you can return it or you just wasted your hard earned $. I'll never support a company that treats their customers this poorly! I have had my Yonanas for a few months now and we love it. It does NOT make anything runny as the poster mentioned above. The consistency is that of ice cream. I am very pleased with this product. I will say however that my motor burned out after only 6 months. I was informed by another user that if the frozen fruit is not thawed for at least 15 mins. The motor burns out. I usually thaw 10 mins. But it could be true. I did not save the box so I cannot return it to the shopping channel. But I am ordering a new one. And will do so the next time around. I will also be sure to thaw longer. The kids are really pissy without their yonanas. Don't believe the naysayer(s). It truely IS an amazing invention. I don't miss ice cream one iota. I love the treats yonanas makes, but had it under a week and the motor has stopped working. I've let the fruit thaw for 15 mins as instructed by the manual. Very sad. Hopefully the replacement will last longer.